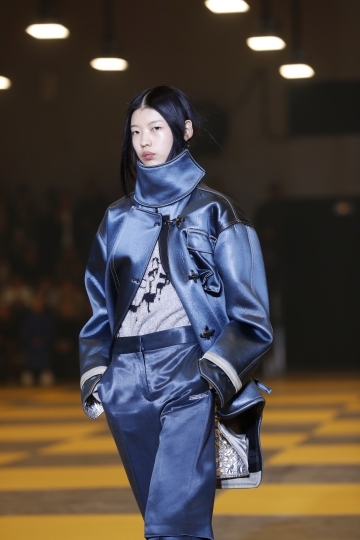 PARIS — High-collared, fluid silhouettes teeming with detail were the Paris Fashion Week recipe when Chloe showcased its latest winter collection and bid adieu to former designer Karl Lagerfeld, who died on Feb. 19. 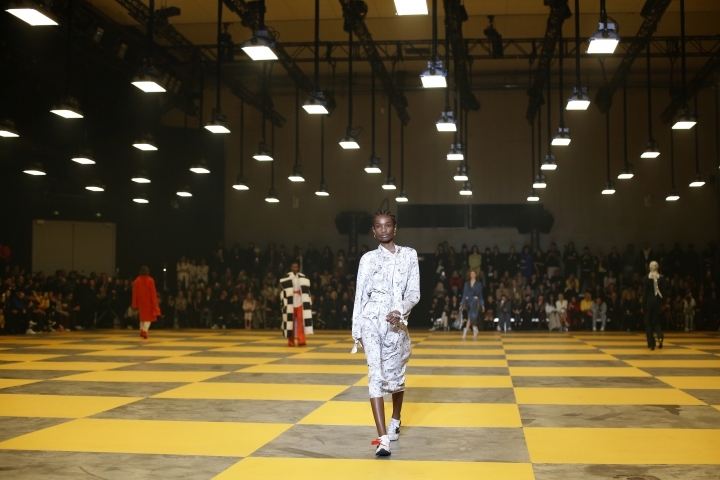 Rick Owens, meanwhile, pushed the envelope with a truly frightening and mesmerizing show that featured alien styles inspired by American rock group Kiss. Designer Natacha Ramsay-Levi produced a diverse and saleable collection with rich design pickings — but failed to really light a winter spark. 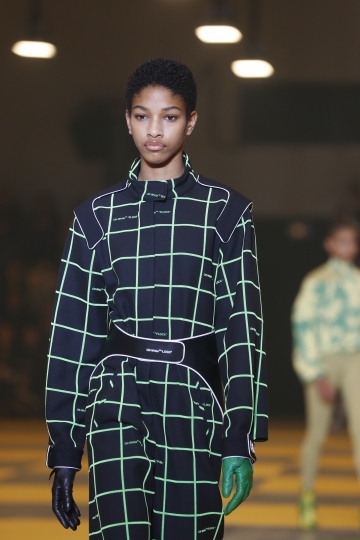 VIP guests at Paris' Maison de la Radio were treated to a display featuring round shoulders — a key theme this season — alongside a diaphanous, tubular sleeve that subtly referenced the house's 70s DNA. While, floral motifs and prints created a visual kinesis, an effect accentuated by ethnic patterns and tribal jewelry. Pervading the 55 looks displayed in the morning show, however, was a low-energy, grounded and sensible feel. 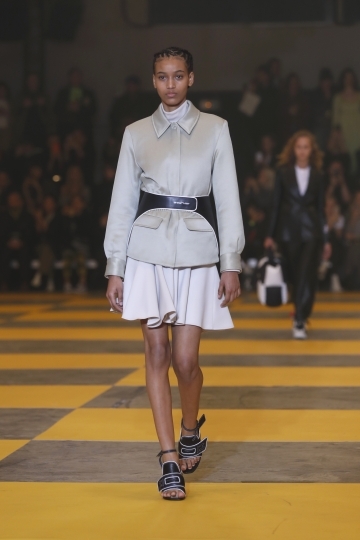 High collars and statement on-trend lapels did away with the notion of a bust, and the footwear consisted of sturdy, equestrian-inspired boots with square heels. Still, there were some beautiful individual garments, such as an off-white knit sweater with sleeves attached by gold buttons at the elbow that captured a sportswear-meets-aristocrat vibe. 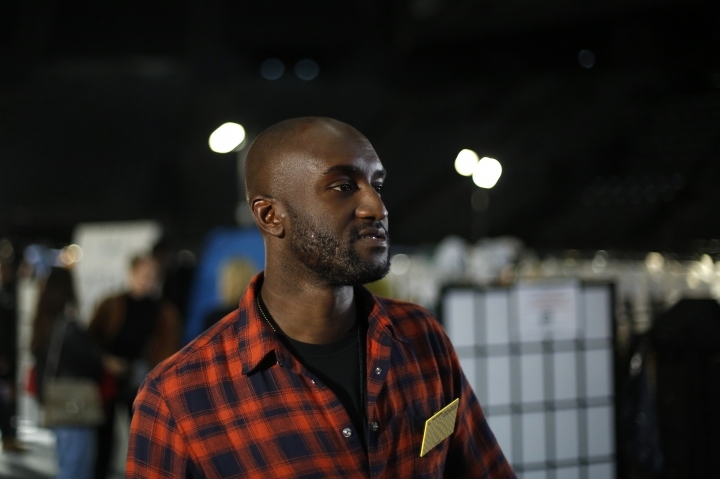 Illustrating the frenetic pace of fashion week show schedules, guests rushed out so quickly at the end of the display that Ramsay-Levi was blocked from taking a bow in one of the main runway halls. She just smiled and laughed. Lagerfeld exerted a giant influence on the global fashion industry. Designers including Dior's Maria Grazia Chiuri have peppered their collection notes with poignant tributes this week. On Thursday, it was Chloe's turn to bid farewell to the couturier, who was the house's longtime creative director from the '70s — a post that was somewhat overshadowed by his more famous tenure at Chanel. Chloe praised the German-born designer's "incalculable genius" over 25 years with the house. A wad of postcards was placed on each guest's seat, remembering Lagerfeld's most important moments with the brand in his own words. "I love dresses straight out of fairy tales — that are the color of the moon; that are as bright as the sun," one read. The lauded American designer again drew inspiration from Larry LeGaspi, the U.S. designer whose silver and black space-age looks were worn by rock bands such as Kiss. It was the same starting point as his provocative men's show of last month: A sort of a reverential homage to LeGaspi's bombastic styles. This runway collection, though, was very different from the men's fare in more ways than one. 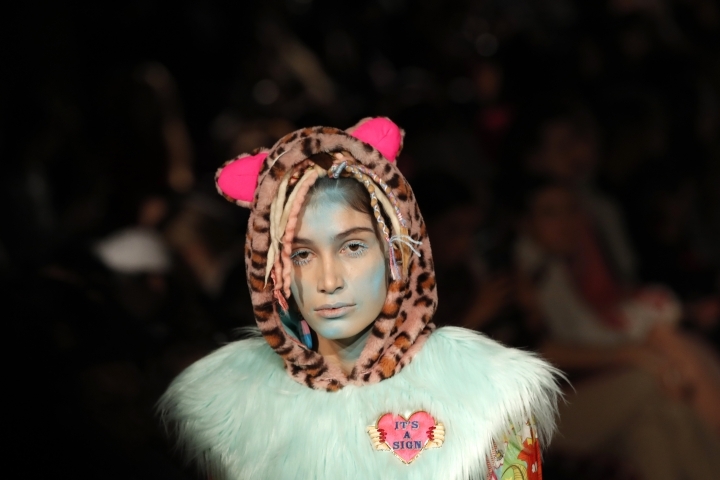 Models in monster-like face makeup — horns, alien-like nose cartilage, billowing wigs, and giant black pupils — strode out inside the Palais de Tokyo venue. It had some guests gasping, and others reaching for their cameras. Though the first styles focused on long, beautifully tailored coats — this classicism didn't last long. Platform boots, which elongated the body in a nod to 1970s glam rock, soon led to exaggerated silhouettes with big curved shoulders. Then, Owens' signature envelope-pushing began: In the form of giant, sheeny space-age sleeves that might well have been a Martian's answer to a leg-of-mutton design. 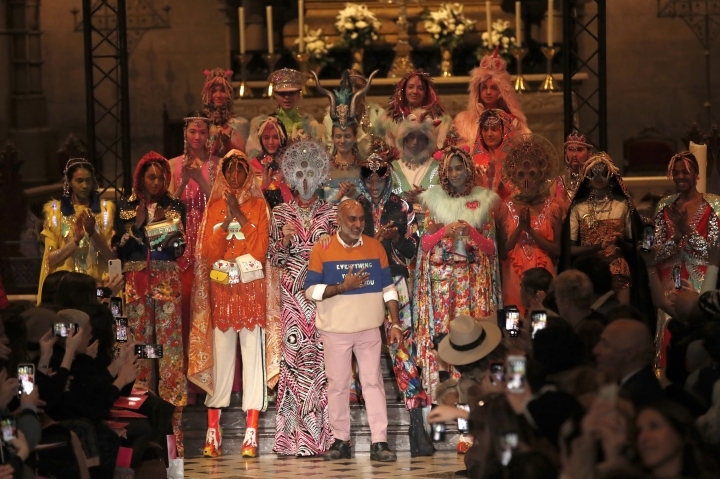 Manish Arora's show opened with aplomb. 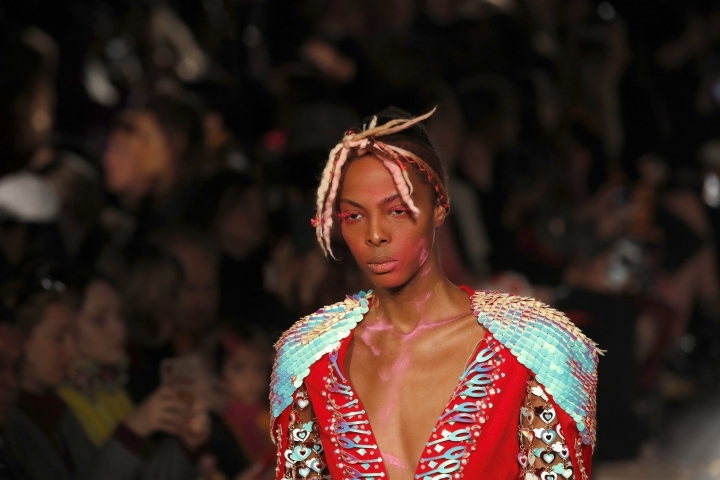 A hooded model with patchy orange makeup and a bejeweled visor strutted out in a multicolor striped sweater emblazoned with "Finally Normal People." 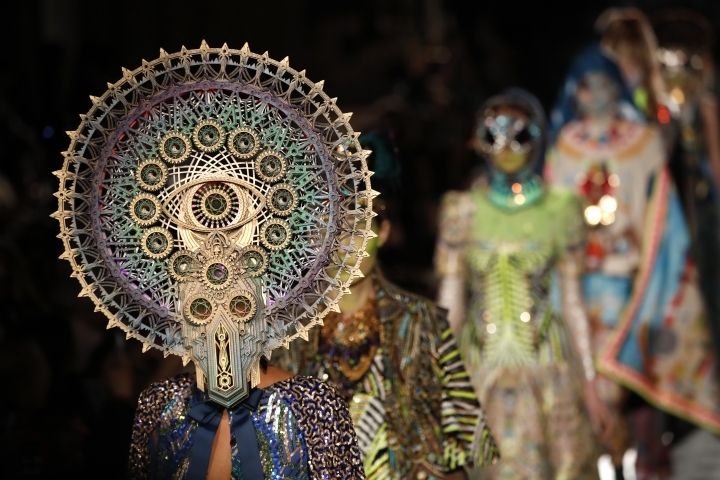 It set an ironic tone for the exuberant Indian designer's show. Arora, who went in a more sophisticated direction last season, settled back this fall-winter in his tried-and-tested flamboyant styles. "The collection comprises a motley cru (sic) of Mad Max bohemians straight out of a dystopian future," declared the program notes. The result was a sort of punk-meets-Bollywood vibe for many of the 34 ensembles — delivered in eye-popping color. 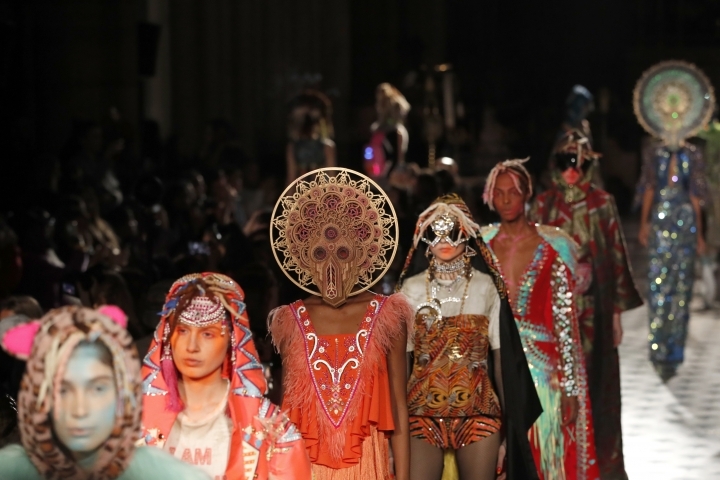 Pieced together, there were fleeces, fringing, horned and Mohican-style headpieces, leopard-print hoods, sparkly leggings and dresses with diverse silhouettes. The sheer scale of the excess made this unlikely collection somehow work. On Wednesday night, some of the fashion industry elite attended a cocktail party at the Paris residence of Jamie D. McCourt, the U.S. ambassador to France. The party kicked off celebrations for the upcoming Statue of Liberty Museum in New York. Belgian-American fashion designer and philanthropist Diane von Furstenberg, who reportedly raised over $100 million for the museum, was a guest of honor. Attendees included models Karlie Kloss and Natalia Vodianova, as well as U.S. Vogue Editor Anna Wintour in a bold red and white cape. Paris has a special significance for the Statue of Liberty, as the iconic monument was originally a gift from the people of France to the people of the United States in 1886 and was designed by French sculptor Frederic Auguste Bartholdi.